The royal palace in Mysore is named the Amba Vilas Palace (meaning house of goddess Parvati), but is more commonly known as the Mysore Maharaja's Palace. 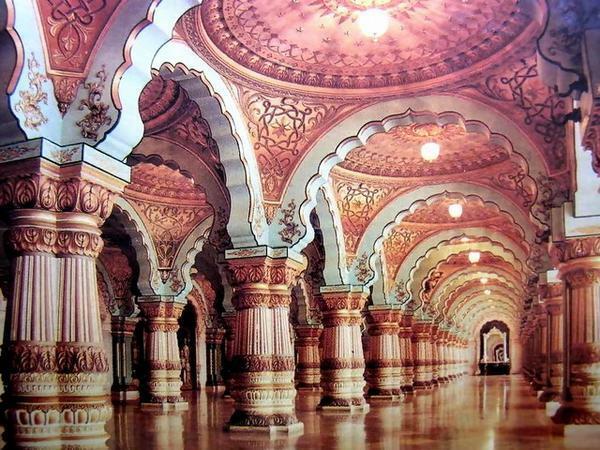 The Mysore Palace is one of the many grand palaces located in Mysore, a small city of palaces in southern India. It was first commissioned by the Wodeyar kings in the 14th century, but was re-built many times since then. The current Mysore Palace of the Wodeyar Maharajas, as it now stands, was commissioned in 1897 by Queen Vani Vilas Sannidhna. It took around 15 years to build this beautiful palace, and construction was finally finished in 1912. In 1940, the Amba Vilas Palace was expanded to include a few more rooms and the ornate Public Darbar Hall wing. The architecture of the Mysore Palace is generally described as Indo-Saracenic, and was designed by a British architect named Henry Irwin. The palace is a unique blend of the Rajput, Muslim, Hindu and Gothic architectural styles, and has beautiful designs in multiple colours, across the walls and ceilings. The Amba Vilas Palace is spread over three floors, and has a grand tower that measures 145 feet. The walls of the Mysore palace building are made from fine grey granite, while the domes are made from deep pink marble. There are seven huge arches on the façade of the palace, with two small arches on either side of the main central arch. A beautiful sculpture of the Goddess Gajalakshmi stands above the central arch of the Mysore Palace. Around the palace is a beautiful garden, with paths and landscaping work. The Ambavilasa Room: This room was used by the king for entertaining private audiences. It has beautiful gilded columns, stained glass ceilings, decorative steel grills and sparkling chandeliers with fine floral motifs. The floor of the palace is decorated with precious stones and is highly polished. The Doll’s Pavilion: Also known as Gombe Thotti, the Doll’s Pavilion is a room with displays of traditional dolls and sculptures, both Indian and Europeans, from the 18th and 19th centuries. The Kalyana Mantapa: This is the grand marriage hall. It is an octagonal-shaped pavilion with a ceiling made from stained glass in multiple hues. The main patterns on this ornate glass ceiling are peacock motifs and geometrical patterns. The Mysore Palace has two ceremonial meeting halls, also known as durbar halls, in which the royal court used to meet for official business. Both halls are beautifully gilded, and decorated with gold-coloured items and royal maroon curtains. 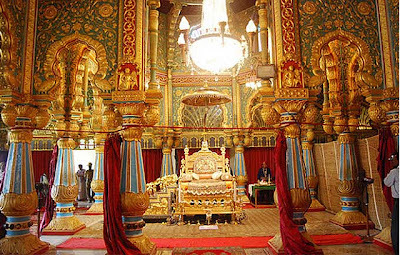 The descendants of the Wodeyar kings continue to live in a section of the palace, till date. However, as India is a democratic republic, the royal family has no political or administrative power of any kind, nor can they use the title of 'Maharaja or Maharani'. During the months of September and October, the famous Dasara festival is celebrated at the Mysore Palace, for which the entire palace is illuminated with rows of lights, numbering around 96,000. The golden throne is also displayed to the people during this period. 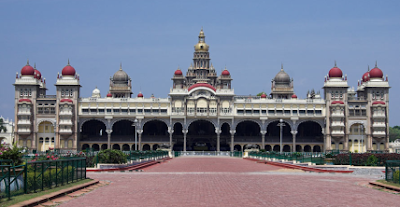 The Mysore Palace in India is open daily from 10.00am to 5.30 pm. Tickets are priced at 200 INR for foreign tourists and 40 INR for Indian tourists. Visitors are required to remove their footwear before entering the palace. Photography is strictly prohibited inside the palace, but you can take photos from outside. 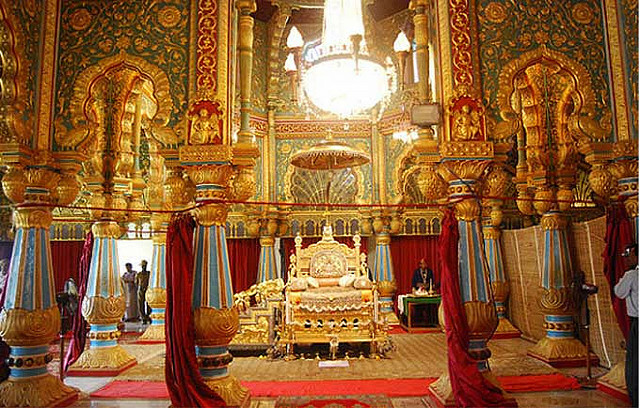 What do you think of the beautiful Amba Vilas Palace in Mysore, India? Would you like to visit it?